When your child is preparing to go to an overnight camp during the summer, it is customary to sew labels on his or her clothing to ensure that another child does not accidentally take his or her items. Although you can have your child's name printed onto name labels, you can make the name look more decorative on clothes by sewing on a name applique. You can sew an applique using a few materials that can be found at any craft store. Lay out the fabric you want to use onto a table or counter top. Draw out the letters using a fabric pencil, then cut out the letters with scissors. Place the fabric letters upside down onto an ironing board, and lay a sheet of bonding fabric over the letters. Iron the bonding fabric over the fabric letters on the high heat setting for one minute. Allow the fabric to cool for one minute. Cut around the letters again. This will cut out the bonding fabric to perfectly match the fabric letters. Peel off the backing from the fabric letters, and arrange them onto the cloth or article of clothing that you want to sew the name onto. Iron on top of the fabric letters using high heat, which will adhere the letters onto the cloth. Allow the cloth to cool for one minute. Thread a needle with colorful thread, and stitch around each of the letters using a chain or blanket stitch. This will make the letters look as though they were hand sewn onto the cloth without the aid of bonding fabric. 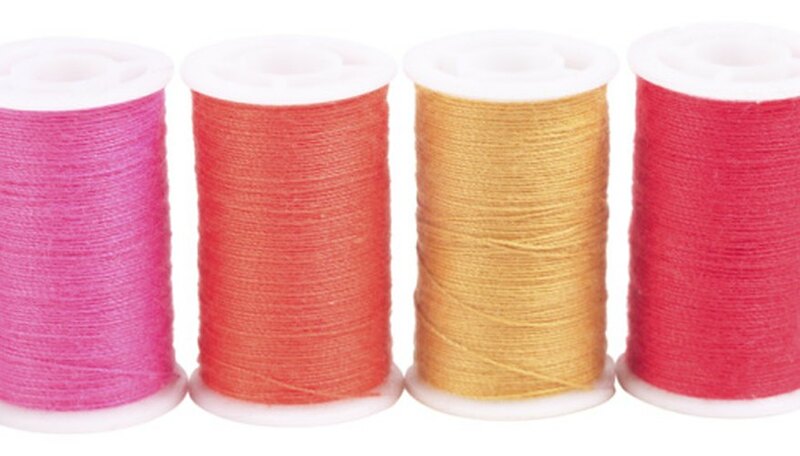 Cut off any excess thread before using the cloth or article of clothing. Keep the iron out of the reach of children. Hot irons can cause severe and serious burns on skin upon contact. Keep all needles and scissors out of the reach of children.